The word vegan elicits a lot of connotations, not just about who we are (freaks), but what we eat. When you take away not only all meat, but eggs, cheese, milk, etc., people wonder, “What is left?” The most common assumption is that all vegans eat is salad. Well, I hate salad. I don’t understand it; it typically has no nutrition, and generally serves only as a vehicle for a dressing that defeats the purpose of vegetables. So, until now, I never really ate it. I do, however, love cooking shows. PBS, Food Network, the Cooking Channel, you name it. I grew up with Saturday mornings of the Frugal Gourmet, Jacques Pepin, and Yan Can Cook. But, my favorite cooking shows are not very vegan friendly, except, of course, for the salad. One person who does this exceptionally well is the Food Network’s newest host Aarti Sequeira. Her show, “Aarti Party” (Sundays at noon), is all about injecting American favorites with Indian flair. She makes such beautifully unusual salads that she has converted me to the side of mixed greens. I have two of her recipes below, the Cabbage Apple Slaw and the Massaged Kale Salad. I’m also including my very favorite summer salad (make it now before it’s too late! 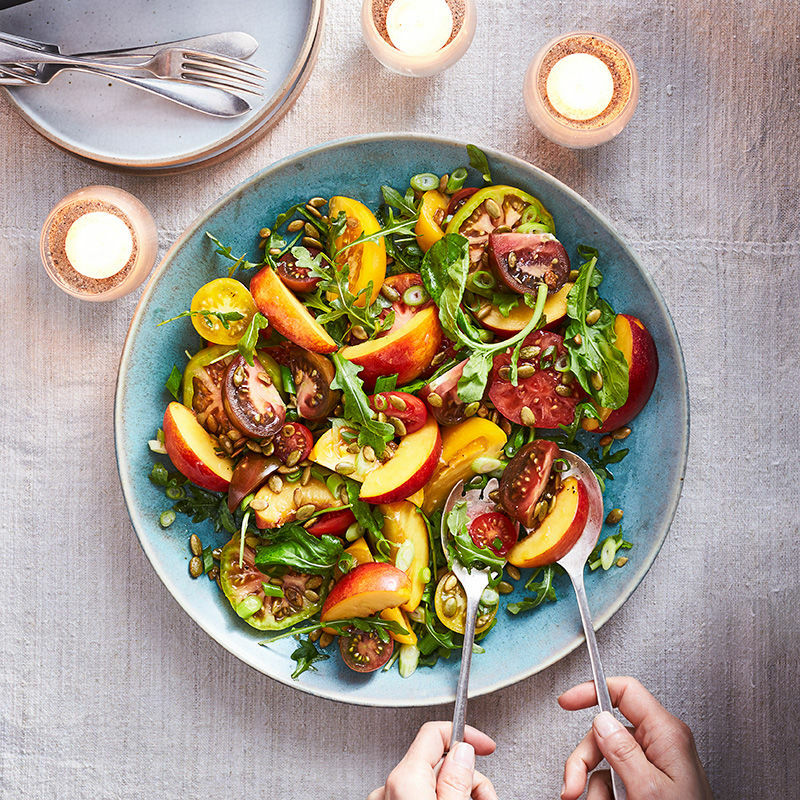 ), Tomato Nectarine Salad. The latter was brought to me by my friend Jessica, who has cooked dinner for me more times than I can count, and continued to invite me over even after I became vegan. It might seem counterintuitive to end a post about the erroneous stereotype that “vegans only eat salad” with three salad recipes, but if that were true, these salads would make being vegan worthwhile! Dice tomatoes and nectarines into approximately the same size, 1″ cubes. Add to a large bowl. You can add the onion raw, however, I like to saute them lightly to take out a little of the bite. Add onions, cilantro, olive oil, lemon juice, salt and pepper to the fruit and toss. Serve immediately, or refrigerate for later. Add kale to a large bowl. Whisk together lemon juice, olive oil, salt and pepper. Pour half the vinaigrette over the kale. Massage for two to three minutes. It will start to break down and give off a banana smell. Add the nectarines and seeds and the rest of the vinaigrette. Toss and serve. This gets better and better so set some aside for the next day too!